Many of our readers have expressed interest in scaling back and living in smaller homes. We have taken this to the extreme by moving into a 250 square foot bus which accommodates ourselves our two pets and most everything we own. We introduced this concept in our earlier post Living Small. Through trial, error and research, we have learned a lot about the importance of good design in a tiny home. The smaller the home is, the more important it is to use your space well. What we have found is that there are some fantastic consequences in thinking and building in this manner that could be applied to any space, large or small. What we have discovered is that our small space is comfortable to live in, easy to clean, reduces clutter and has a completely unique feel. In this post I will take you through the process my thinking, designing and building a cabinet to fit our small space. 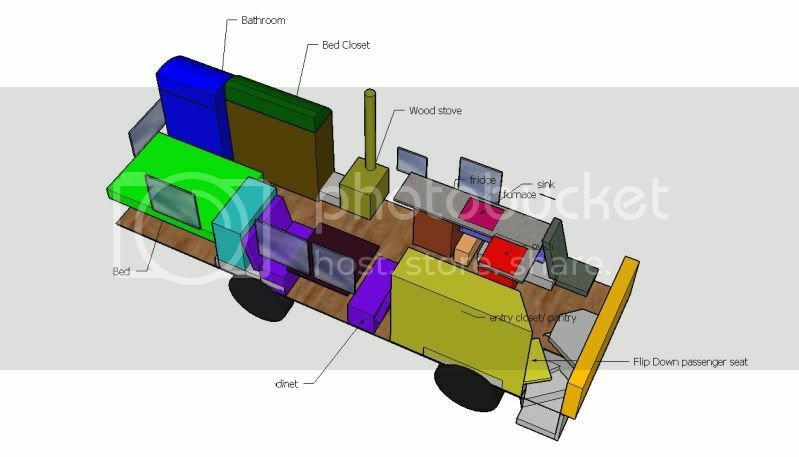 This is an image from Google SketchUp which we used to create our floor-plan. We are nearing the finish-line on the interior of the bus (the exterior is a different story which is waiting for springtime). One of the last major interior projects is a cabinet that will fit above our dinette. The purpose of this cabinet is to house a pile of miscellaneous items that we use on a fairly regular basis. Until now, these items have resided in a box in the storage area underneath our bed. This makes them difficult to access and creates clutter in our storage area. The goal is to make these items accessible and organized in a manner that does not crowd our tiny space. The cabinet will also serve as a platform to mount one last set of LED lights over the table area. This is the space where we want our new cabinet. There are a few things to consider when approaching a small space project like this one. The following are questions I ask myself when designing a new feature in a small space. These ideas are based on my own experience as well as many other peoples examples. What space is available? : Even in a tiny home like ours there are a few areas that are rarely, if ever, used. The area above our dinette is one of them. You can really only sit down when you are next to the wall of the dinette, so this is one of only places on the bus that we can have overhead storage. There is no useful wall space for anything else, so why not turn it into something beneficial? Will the design element make the space feel crowded? : This is a major concern for us and one of the most difficult issues to address. With a space that is just one step away from feeling over-crowded, we need to be very cautious about adding anything new to it. We have avoided the threat of claustrophobia by providing a lot of light. We 5 windows which is a lot for our small space. We have also used lighter colors on the floor, ceiling and walls to reflect this incoming light. Just like in a larger house, compartmentalization makes the over-all space feel small while open floor plans tend to maximize it. This concept is compounded in tiny homes. Even though much of our floor plan was pretty restricted by the challenges of putting plumbing in a moving vehicle, I still tried my best to keep the sight-lines open. There are few places on the bus that you can't see from one end to the other, thereby maximizing feeling of space. We did use some partial walls to give a feeling of separate areas without crowding the overall space. While we have basically accepted that there is NO privacy inside the bus, aside from our tiny bathroom, one might remedy this with curtains which could serve as moveable walls. For this project, the planned cabinet location will work well within these parameters so long as I keep it fairly shallow. By doing this, it will not restrict the view out the window while standing up nor the view to or from the bed area behind it. Visualizing this can be very difficult and we have found that using simple cardboard mock-ups can be helpful in judging how the element will affect the space. How does the design add to the space? : This is the fun part for me. Since we really need to use every inch of usable space for functional purposes, we don't have much room for decorations like pictures and paintings. For this reason, I have found that adding a little artistic flare to the design helps to keep the space from feeling regimental. While squares are by far the most efficient use of space, they don't make a small space feel very comfortable. I figure since we basically live in a nest, why not make it feel like one. We already have the curve of the bus ceiling, so I have carried that feeling through many of my designs. Just a simple curved shelf or wall cut-out can make a square cabinet fell a bit less boxy and a little more organic. For the dinette cabinet I will continue this concept with a gentle arch over the table. I also want to add a little extra artistic element that will individualize the space and offer something interesting to look at (more on this later). After answering the previous three questions I am ready to start designing the cabinet to fit the space. I begin by making a very basic sketch of my ideas. It is a very rough approximation just to get my general vision on paper so that I have something to work from. My first sketch below shows the basic elements in the general space. So far I like the way that the cabinet fits. I also add some curved shelves to the right end of the cabinet as well as underneath the right side to give the whole space a rounder feel. I like the idea off having three compartments because it will center well over the table. I also am considering leaving the center compartment open as more of a display shelf since we don't have a lot of that kind of space in the bus. I also think that by leaving it open it may add depth and not feel too encroaching. A basic sketch of my idea. The next step is to refine this sketch with accurate dimensions. As I mentioned before, one of the most important things to consider in designing for a small space is how everything will have its own organized spot. The best way to do this is to physically lay out the items that you are designing around. I gathered all of the miscellaneous items from under the bed and started to arrange them in a way that I thought might make sense for a long narrow cabinet. I took note of the dimensions of the larger items for use later on. Some of the things that will be stored in the cabinet that we are making. Now it is time to get some real measurements and come up with an actual design. I go back to the bus armed with a tape measure and some scraps of cardboard. By using the Item dimensions I have an idea of my minimum height and depth. By holding the cardboard up at various locations (mimicking the potential face, bottom and sides of the cabinet)I get a better idea just how much space I can use without crowding or making it difficult to maneuver around. I write down the final dimensions and its back to the drawing board. This drawing is much closer to scale which allows me to actually see how the cabinet will look in real life and allows me to make changes simply by erasing instead of cutting new boards! After a lot of erasing and re-drawing, I have something that will fit all of the dimensions and fits well enough in to my original vision. I also add some cut out shapes along the bottom edge of the cabinet which will be back-lit by the light underneath. This will serve as the artistic piece I had wanted to incorporate into the design. The fun is in watching your design come to fruition. It always amazes me when a fuzzy idea materializes into a physical object. I make a few minor changes in the design because reality always works out a bit differently then you think it will on paper. I decide on using the moon phases for the cut-outs because of the design symmetry and that I think an illuminated moon will look pretty cool! When I have got the face of the cabinet made, I position it in the bus to make sure I haven't made any miscalculations or want to make last changes. Fortunately I am happy with it and continue building. I start by tracing the cabinet face design then cutting the moon phases. Once I have almost all of the pieces, I put it up again with a couple of screws to make sure every thing fits. With a little trimming it should work well. I also realize at this point that the center bay just feels like it is missing a door and it will make it safer when we are moving. I decide to go against my original idea (which isn't always easy) and add a middle door. Construction completed with doors and shelves. Many thanks to Tammy and Jeff for letting me use their shop. It"s so much better then working outside in the winter! Last week marked the beginning of our own personal dairy revolution. Heidi and I have always had something of a love-affair with dairy products. Cheese, butter, ice-cream and yogurt are all way up there on our list of favorite foods. This is not going to be a post debating the virtues and risks of raw milk consumption. There is plenty of info on the web concerning raw milk that is written by people with far better credentials then I. Realmilk.com is one great resource for info on this subject. All I will say is that knowing the farmer, the farm and the actual cows that our milk comes from has increased our appreciation of dairy products in ways we never thought possible. The product is natural, it's healthy, an actual person is accountable for its quality and above all, it is unbelievably delicious. I can also say that some amount of lactose intolerance may not be an issue with raw milk. Our raw milk farmer is a living testament to this. What I want to focus on today is the amazing possibilities contained within a single gallon of raw milk. What really precipitated our experimentation was actually one of the disadvantages of raw milk. Since raw milk has not been pasteurized it has a shorter shelf-life than store bought milk. Seven to ten days is generally a good range to count on provided you keep the milk as cold as possible from the moment of milking. Our milk provider distributes milk by the gallon. Since neither of us drink copious amounts of plain milk, we needed to find other methods to consume or preserve our precious resource before the week was up. We have been making yogurt regularly for over a year now and we have no problem devouring a quart of the stuff each week. The only difference in making raw milk yogurt is that you do not heat the milk above the ideal culture temp (110 degrees) in order to preserve the beneficial properties of the milk. You may heat it to the point of pasteurization if you wish to extend the life and/or reculture the next batch, you will simply lose some of the benefits (and risks) of raw milk. Lisa Lynn of the Self Sufficient HomeAcre blog recently made a great post about Making Raw Yogurt. A ball of mozzarella ready for the freezer or pizza! So one quart went to making a delicious raw yogurt. We use about a quart of plain milk for our daily use in breakfast cereal, coffee, cooking etc. What to do with the other half-gallon? How about cheese? We looked for the most straight forward recipe and found an easy one for mozzarella. Although traditionally mozzarella was made from cultured water buffalo milk, most mozzarella today is made from cows milk. You can make a great quick mozzarella without using a culture. We used this recipe from the New England Cheese Making Supply Company. For me, cheese making is like going back to high school chemistry class except that the results are edible and there's no lab grade to stress out about. There are some amazing things that happen in a pot of milk when you add heat and something acidic. Seeing the curds separate from the whey and then making those curds into a crazy stretchy substance that is ultimately a delectable, melty pizza topping is a truly awesome experience. The only problem with making cheese is that you only get a baseball sized hunk out of a half-gallon and what remains is a greenish liquid by-product called whey. It feels like a complete waste of precious milk. But don't worry, a little searching turns up all kinds of things you can do with whey. For one thing, you can make more cheese! Ricotta is made from leftover whey. By heating the whey to a higher temperature and adding a bit more acid (citric acid or vinegar) the whey releases a fine flaky curd that can be strained to make ricotta. Whey, the bi-product of cheese making. Using whey as a fermentation starter for sour kraut. So just to recap here. With a single gallon of milk in one week we made: 1 quart of yogurt, 1/3lb of Mozzarella cheese, 1 cup of ricotta cheese, started a batch of sour kraut, made three loaves of bread, used a quart of whey to cook beans and make soup stock and we still had a quart of milk leftover for daily use! Pretty cool, right? Just a few uses of raw milk from left to right: whey, ricotta, mozzarella, yogurt, bread and sour kraut.